The last thing that can be said about the PLO’s chief negotiator Saeb Erekat is that he suffers from a lack of BBC airtime but nevertheless, the end of May saw him back at one of his regular spots – ‘Hardtalk‘. If that sounds familiar, that may be because only last year Erekat made a very similar statement during a previous ‘Hardtalk’ interview. In other words, for four years at least Saeb Erekat has been pushing the same broken record mantra and not one BBC journalist has bothered to follow it up by informing audiences that not all Israelis are Jews – as the country’s two million strong non-Jewish population (25.1%) indicates – or by asking him why Jews cannot be citizens of a Palestinian state. Let’s take look at some of the other falsehoods propagated by Erekat – with no disturbance from Badawi – in this programme. There is of course no such thing as “’67 borders” because the 1949 Armistice Lines were specifically defined as not being borders – as even the BBC’s style guide notes. Nevertheless, Badawi makes no effort to clarify the point to viewers. Those “East Jerusalem” apartments are in fact located in Ramat Shlomo and have been going through the planning process since 2010. One Israeli minister has approached the Finance Ministry with a request for new offices in Jerusalem. The same ministry has a long existing office in the Sheikh Jarrah neighbourhood of Jerusalem: an area which was classified as no-man’s land throughout the 19 years of the Jordanian occupation of parts of Jerusalem. There are no “sterilized buses” and the restriction on travel for PA registered vehicles on certain small sections of road arises from the very real security issues which of course do not get a mention in this programme at all. Like the vast majority of Palestinians in Judea & Samaria, Saeb Erekat lives under full Palestinian Authority control. The topic of Palestinian self-rule in areas A&B is of course not mentioned at any point in this programme either and Badawi sits idly by as Erekat promotes the false and defamatory notion of a system of ‘apartheid’ worse “than the one that existed in South Africa”. The “agreements” and “contracts” signed between the Palestinians and Israel are the Oslo Accords. In contrast to the misleading impression given to viewers of this programme, nowhere in those agreements is any restriction placed on building in Israeli towns and villages in Judea & Samaria or Jerusalem and nowhere do they state that the 1949 Armistice Lines – or “67 lines” as Erekat calls them – would be the final borders between Israel and a Palestinian state. That, of course, is precisely why the subject of borders is one of the issues to be discussed in final status negotiations. The Quartet’s February 2015 statement makes no mention of “1967” and neither does its 2003 roadmap stipulate that Erekat’s much-touted “1967 lines” are a basis for negotiations. “And of course, as you say, international law says that the settlements are illegal. Once again the BBC breaches its own editorial guidelines on impartiality by failing to inform audiences of the existence of legal opinions which disagree with the politically partial line it chooses to promote. Were viewers of this programme provided with factual information which would aid them in building an “understanding of international issues“? Regrettably, no. Were they provided with unchallenged misinformation in breach of BBC editorial guidelines on accuracy and impartiality? Unfortunately, yes. 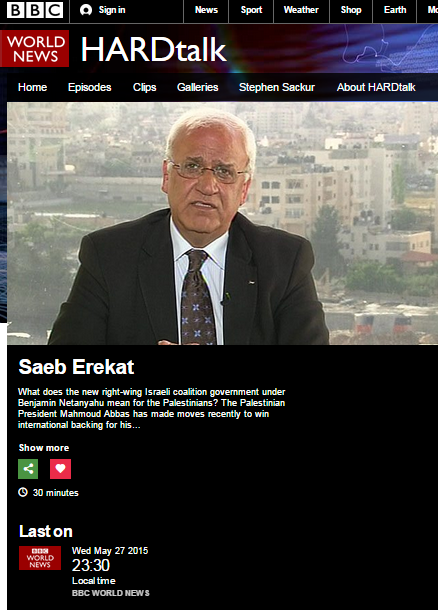 That, however, is par for the course in any BBC content featuring Saeb Erekat. BBC Rule no 1: never question a Palestinian’s account. Max Keiser stated,when interviewed by Alex Jones recently,that the BBC aggressively censored him before appearing,saying he unequivocally cannot mention Israel in any context whatsoever.Gibbs told him point blank there was a list he can & cannot say.Needless to say,Gibbs got his just deserts & died of cancer. Someone in the corridors of power at the BBC, has now elevated Evan Davis of ‘Dragons Den’ fame to new heights of presenting and opinion. Evan can be heard on TV & Radio espousing on everything from the economy, outsourcing, social trends, and – oh yes – ISRAEL. His eyes crossed over even further last week when putting the boot into unsuspecting Israeli politician Tzipi Livni – http://honestreporting.com/bbc-to-livni-would-you-describe-your-parents-as-terrorists/. Livni’s parents were members of the Irgun, fighting the British military in 1940’s Mandate Palestine. Evan writhed with delight as he asked if her parents were terrorists. The BBC shrinks from describing any number of vicious extremist organisations (like IS) as “terrorists” and their Editorial guidelines stress avoiding the use of the word. But blatant ignorance and bias were allowed to shine through when Evan set the tone. His question, albeit a crude attempt to get Livni to use the word “terrorist,” raises serious doubts about his impartiality. Why is it that only Jews and Israelis that can be described as terrorists in the eyes of the BBC and its reporters? Really Auntie – it’s time to STOP DISSING ISRAEL. Send some of your staff over there on a fact finding mission, and then let them pass judgement, instead of discussing history from your annals of inaccuracy and bias.